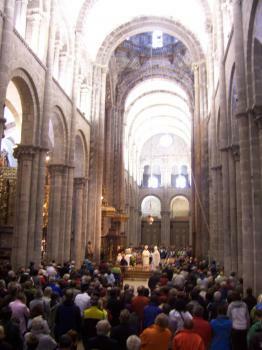 Santiago de Compostela has been a Christian Pilgrimage site since the Middle Ages. It was completely rebuilt in the 11th century, after the Reconquista of this holy site from Islamic rule. It is in Santiago that the supposed remains of the Apostle Saint James ‘the Greater’ are revered since the year 813, and the city was named after him. The town’s romanesque and baroque monuments have influenced art and architecture in the Iberian peninsula. Santiago’s main landmark is the Cathedral, the destination of the medieval pilgrimage route ‘Camino de Santiago’. This was my last WHS left ‘to do’ on mainland Spain: the Old Town of Santiago de Compostela. Hidden away in the far west of the country, it’s actually better accessible from Portugal than from the main Spanish airports. I visited the city on a day trip by rental car from Oporto, on Holy Saturday. (I actually wrote ‘Easter Saturday’ at first, but in the English language this seems to be reserved for the Saturday after Easter Sunday). There’s an hour time difference between Portugal and Spain, so I did not arrive as early as I had wanted. Most of the religious monuments are only open short hours, with a long lunch break or even no afternoon openings at all. And to make things worse it was raining heavily. I hurried directly to the city’s landmark, the Cathedral. 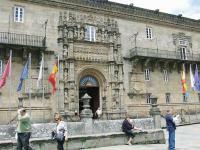 Unfortunately its main entrance, the Façade of the Obradoiro with the Pórtico da Gloria, is undergoing restoration at the moment. You now have to enter via a side entrance. The Cathedral is huge and there’s a lot to admire - especially if you’re a lover of over-the-top baroque. For someone like me, not raised with (Iberian) Catholicism, it feels very kitsch. But to those that come here as a pilgrim, it really is their holy site. I saw people praying at several chapels, lighting candles. I stumbled upon a man in robes inside a wooden box – a fully operational confessional, one of many here. A long queue zigzagged through the church: this consisted of people wanting to enter the narrow passage behind the High Altar, where one can ‘embrace Saint James’ (one of the many pilgrim traditions associated with this Cathedral). When the clock struck 12, all benches were taken and many congregants were standing to attend Mass. While I whiled away my time as a curious bystander (waiting for the rain to end), I wondered what a high-profile target this place would be for Islamic terrorists. It is one of the prime symbols of Christianity in Europe, and the Cathedral is often packed with people. I noticed no security measures at the door when I entered. Only a few security personnel were moving around inside the Cathedral, observing the crowd. They seemed to be preoccupied though by tourists taking photos with flash, and screaming children disturbing the required silence. Santiago de Compostela is closely associated with the battle between Moors and Christians in the Middle Ages. It suffered from Moorish raids between the 8th and 10th century. One of the (many) legends surrounding Saint James had him miraculously appear during the fictional medieval Battle of Clavijo, where Christians fought Muslims. Nicknamed Santiago Matamoros (St. James the Moor-slayer), he appeared as a warrior on the battlefield on a white horse. There’s an equestrian statue of him inside the Cathedral, representing this episode. After Mass I explored the rest of the city center. Santiago isn’t too big. I had not expected to see any pilgrims during this time of the year, but there were many around. Maybe they had hiked a short stretch, I can’t see anyone starting the Camino from the French border in early March. I had lunch at a typical small restaurant enjoying the regional specialty Pulpo a la gallega, and found myself surrounded by female hikers from Northern Europe who could barely get up and walk to the restaurant's toilet. I visited this WHS in May and June 2016 after more than a month walking the Camino Frances. The cathedral in itself is nothing special aesthetically although quite unique as the sculptures of St James dominate the main facades. The main facade and towers are undergoing extensive restoration works but still the cathedral is huge enough to enjoy a slow walk round its exterior. The clock tower houses the cathedral’s largest bell, the Berenguela. It is said that if there are ever 13 strokes at midnight instead of 12, the devil will have an extra magical hour to roam around the dark streets of Galicia's capital. The former pilgrims' hospital, now a parador, has an exquisite facade. Almost every street hides a chapel, a church or a Romanesque, Gothic, Renaissance, Baroque or a Neoclassic building but still in my opinion the old town should not have been inscribed on its own but only as an important part of the Routes to Santiago in Spain. The Alameda park is worth visiting too for a panoramic view of the old town. Obviously this WHS will still have a special place in my heart but more for religious, spiritual and intangible cultural reasons than for its OUV. I'll surely never forget arriving to this place, hugging the kitsch statue of St James, attending mass as a pilgrim like millions of other pilgrims have done before me since the Middle Ages and smelling the incense in the cathedral while the Botafumeiro was swung by at least 8 people to incredible heights, sometimes way too close to the cathedral's windows or ceiling! Santiago almost defeated me. It rained heavily and consistently for the 3 days I was there, the times of masses seemed to never correlate with the information I was given, even the Jamon seemed to be a little less tasty. However I still came away with a somewhat grudging but genuine affection for the city. Whilst the grey Baroque of the Cathedral may not be to everyone's liking (see below) I was impressed by it. I especially liked that it is covered in patches of moss and twigs, which actually add something to the facade. However the original Romanesque Portico de Gloria which is now inside the cathedral is a really impressive sculptural grouping that rewarded repeat viewings. The interior of the cathedral was perhaps not as spectacular as I had thought however entering through the Holy Door to hug the statue of St James, was a fittingly traditional way for me to end my pilgrimage, and also afforded great views of the ornate gold detailing of the Choir. 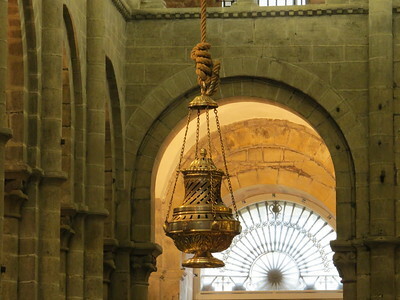 Having attended the Pilgrim's mass in holy year I also managed to see the famous Botafumeiro (incense burner) being swung. There are magnificent views of the cathedral from the park (Caballeira de Santa Susana) just to the west of the centre. Aside from the cathedral there are networks of charming streets throughout the centre, and a wealth of churches, academic buildings and other grand edifices. It also has the feel of a university city, which always makes a place more appealing to me. Also there were plenty of Pilgrims out celebrating the end of their pilgrimage, which also added to the fun of the city. One thing that looks to make the city more interesting is the promising appearance of the City of Culture of Galicia on a hill overlooking the city. It was still being built during my visit (2010) but it did look like a magnificent piece of architecture and will hopefully add more to the already culturally impressive city. I liked Santiago despite the incessant rain; the cathedral is a very impressive end to the major pilgrimage and the city has a very active cultural life. It is a worthy destination (if you have a good umbrella) and an impressive part of the World Heritage list. For the town at the focus of the Route of Santiago de Compostela (listed 1993) it came as an anticlimax for me. The town had little of historical or cultural interest besides the cathedral. Arriving at the railway station the consigna was closed and there was little information on how to reach the cathedral. So I took my luggage on a #6 bus to Praza de Galicia and walked to the cathdral from there. The external staircases are fine and the interior embellishments of the altar and chancel well executed, but not of outstanding universal value. The Pilgrimage to the (supposed) Tomb of Apostle St James the Great at Compostela was of great significance within medieval Europe. Here was one of the world’s first “Tourist journeys” complete with badges, souvenirs and even a guide book! An understanding of those times would be incomplete without an appreciation of the pilgrimage’s place in the medieval consciousness and surely this understanding would be helped by going there oneself? But I can’t say that we personally were particularly impressed by Santiago. The main Plaza with its Palace, Town Hall and Pilgrims’ Hospice (now a Parador) is certainly enormous/impressive as an ensemble and, in my view, is the “best bit”. But the mainly baroque Cathedral which takes up 1 side of the square is in my eyes a bit ugly (even its much vaunted “Portico de la Gloria” – photo) and its Romanesque interior rather oppressive and overbearing. However, enthusiasts of Baroque, Romanesque and Gothic will no doubt find much to enthuse about and admire. Probably, one’s view of its beauty and significance would be considerably enhanced if backed by the faith which has drawn so many people there over the centuries. The chapels inside containing, as well as the “relics” of the Saint and 2 of his disciples, a “piece of the true cross”, will also be of great importance to some visitors. Despite my personal misgivings it is clearly still a “must do” European site for its historical importance, its religious significance and its architectural grandeur, whether you possess the faith or not. I tried hard to imagine the pull it has exerted on people throughout the ages, indeed down to the present day, and the struggles and risks they would face in order to reach it, but the buildings themselves didn’t help me. The inscription in 1985 states “ICOMOS suggests that a number of subsequent proposals be made which will associate various essential sites which are located in several countries under one single heading such as “Paths to Santiago” or “Pilgrimage to Compostela” thereby enhancing the worldwide significance of inscribing Santiago de Compostela on the World Heritage list”. Yet there are now (in 2006) at least 3 more “Compostela” related sites in Spain and France (see my reviews) so this vision never came to pass. I wonder why? Politics and Nationalism no doubt! 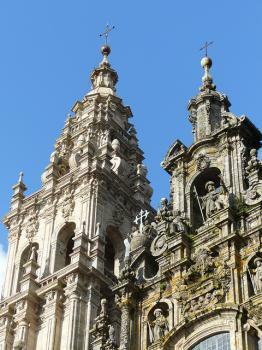 The locations are the Historic Centre of Santiago de Compostela and Santa Maria del Conxo Monastery. Hospitals: Former Hospital and Church of San Roque, "built to provide health care due to the 16th-century plague epidemics"